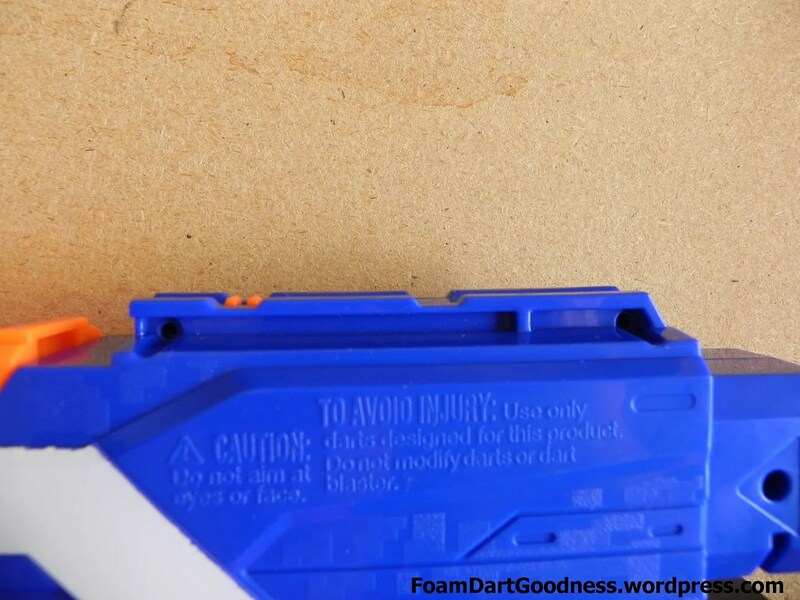 Foam dart blasters – Modifications, reviews and games. Welcome back boys and girls! It’s February and it’s time to get back into posting. 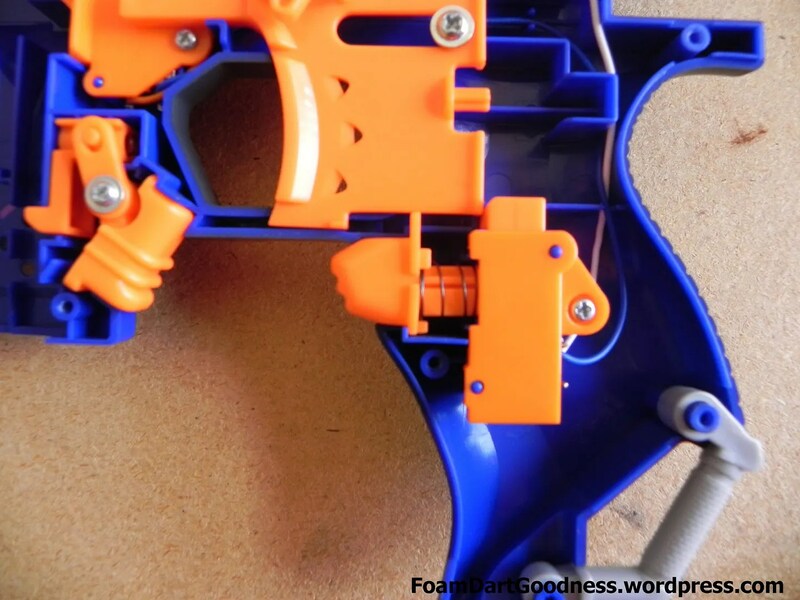 I’m a little sad for this post because I’ve seen a few mod guides on the Stryfe appear over my time off and I kept wanting to link people back to this post to answer a question, but it wasn’t public yet so I couldn’t. Sad face; I know. Anyway, enough stuffing around, lets get to it. 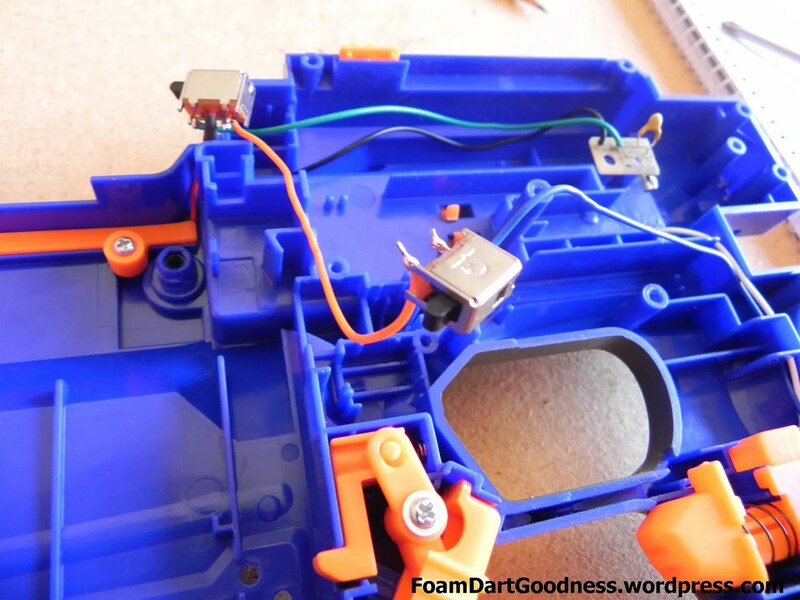 Today we’ll be running through a safety removal and voltage upgrade on the newly released Nerf Stryfe. We’ll start by removing all the screws from the shell. There are two different sized screws in the shell which we’ll need to remember when we come back to reassembly. 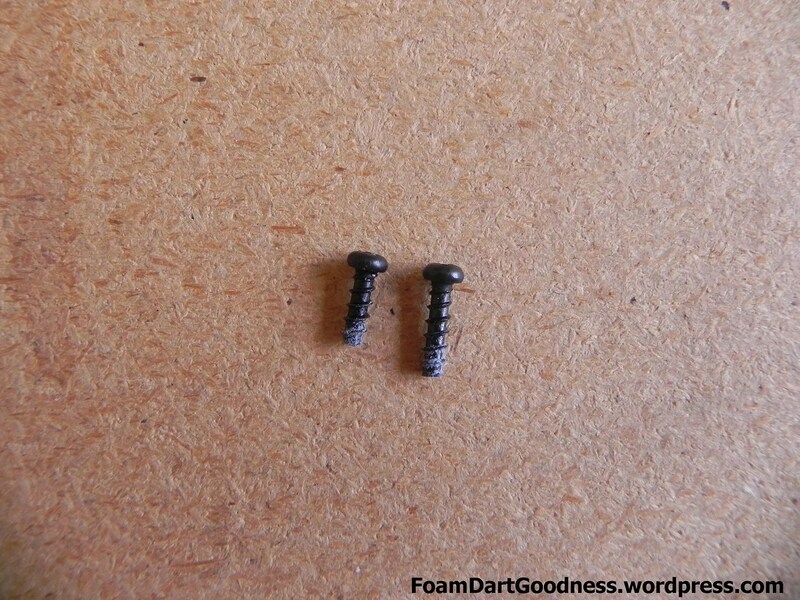 There are two of the smaller screws and they both go here. Ok, once we’re inside take a moment or two to try and get an understanding of the internals and how they work. It will help with reassembly to no end. Cool, lets get back to it. 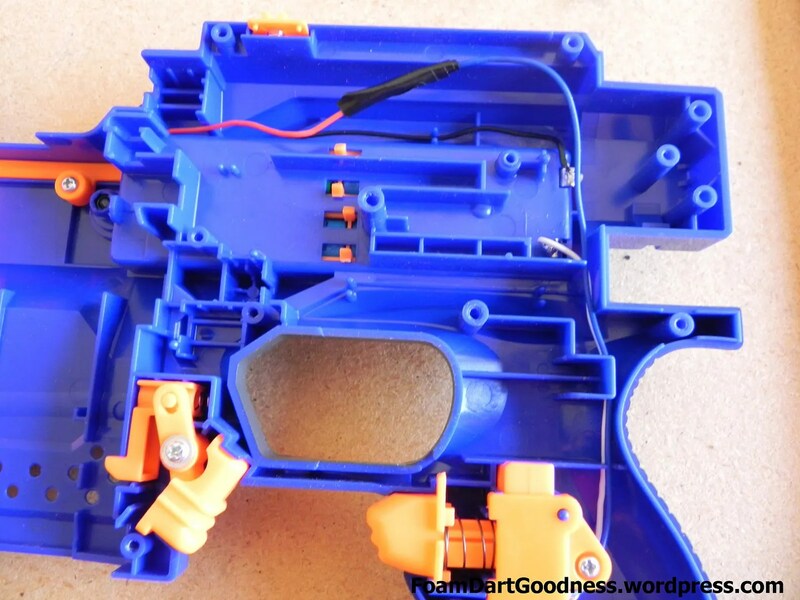 Start by removing the screw that holds the trigger lever in place. Which will then let us remove the whole dart pusher assembly. Then remove the jam door. Then the trigger. It’s held in place by this screw. This is the first safety that we’ll be removing today. 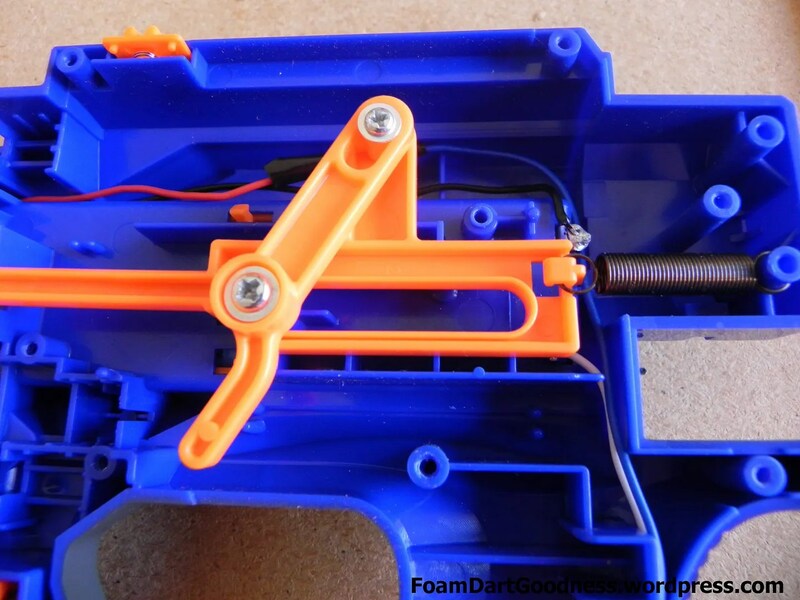 It checks that there’s a clip in the blaster and will cut power to the motors if there isn’t. I don’t want that feature so it goes. Once we remove the cover we’ll find the micro switch. Remove the orange bits here. 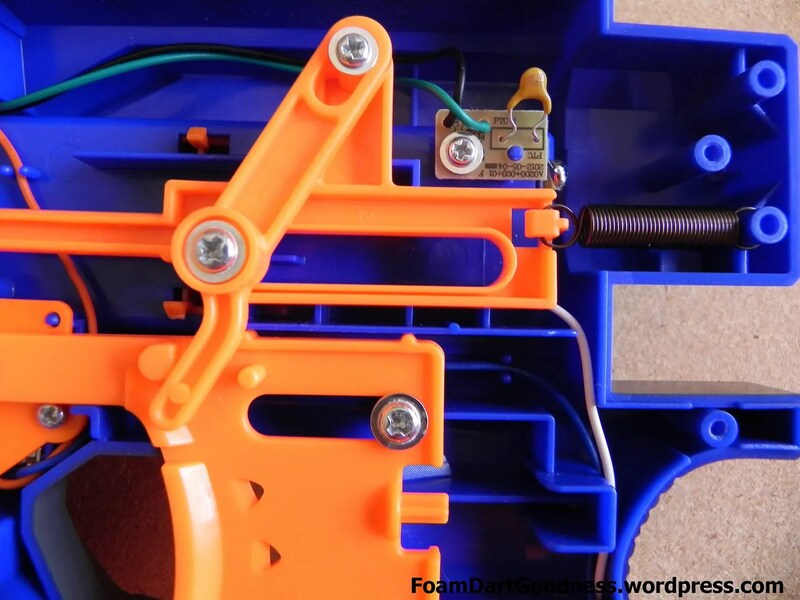 Then we’ll move to the top of the blaster and examine the dart checker safety thing. 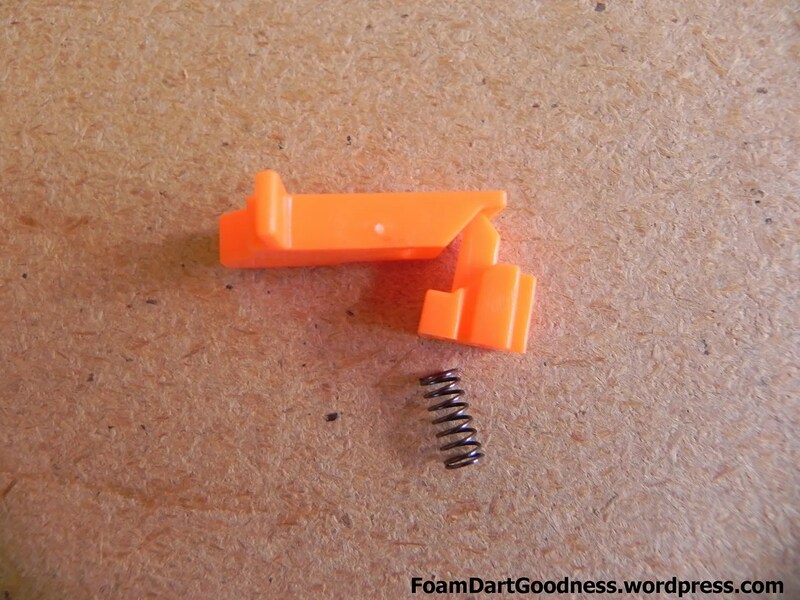 This little orange piece here checks that there’s a dart in the clip and won’t let you pull the trigger without one. Clip in, with dart = dart checker up. With the dart checker down (and the dart pusher back in for the sake of the photo) we can see how it blocks the dart pusher. While when it’s up we can see that it clears. Understand? Cool. So to get around the dart checker, we’re just going to plain old remove it. Even if you do no other mods from this guide, I’d strongly recommend removing it. Many people have reported issues with non-elite clips not triggering the dart pusher so let’s just remove that whole possibility. 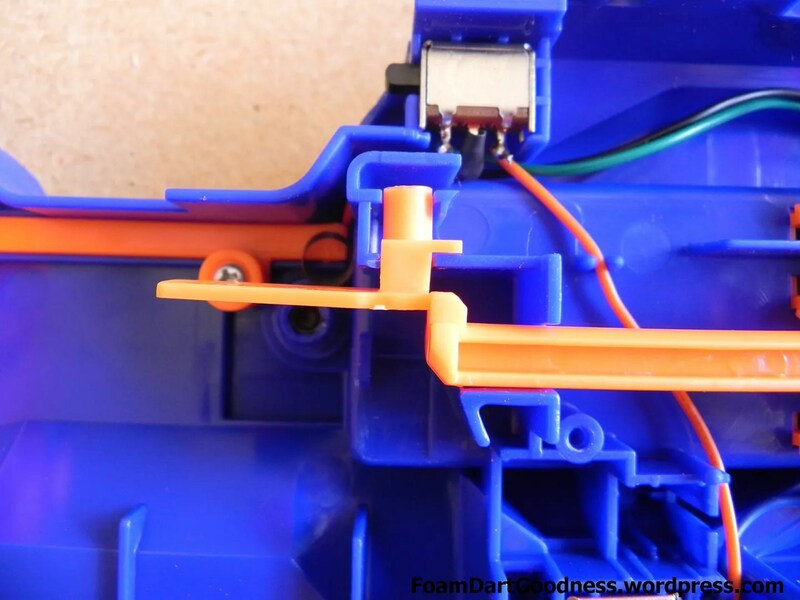 Next up we’ll remove the microswitch that checks if the jam door is closed. We don’t need that either. 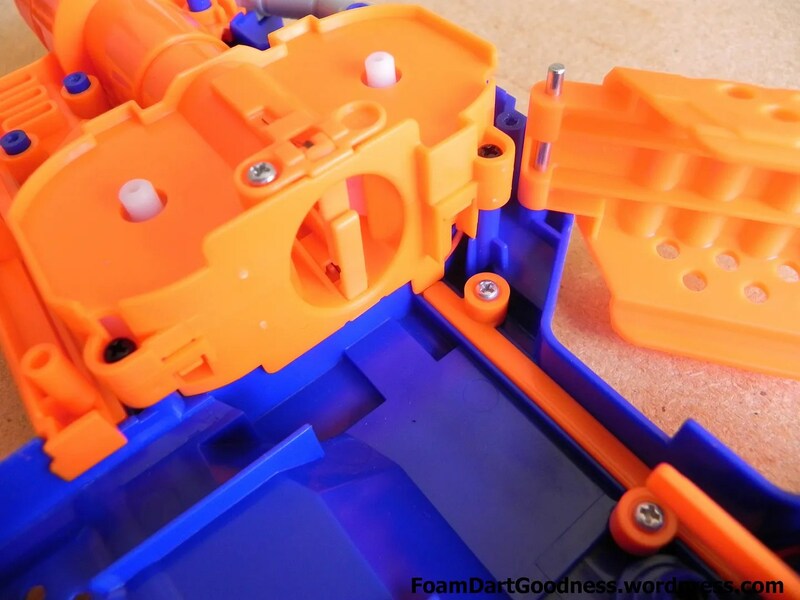 Now at this point we should have two microswitches floating in the shell. We need to bypass these. 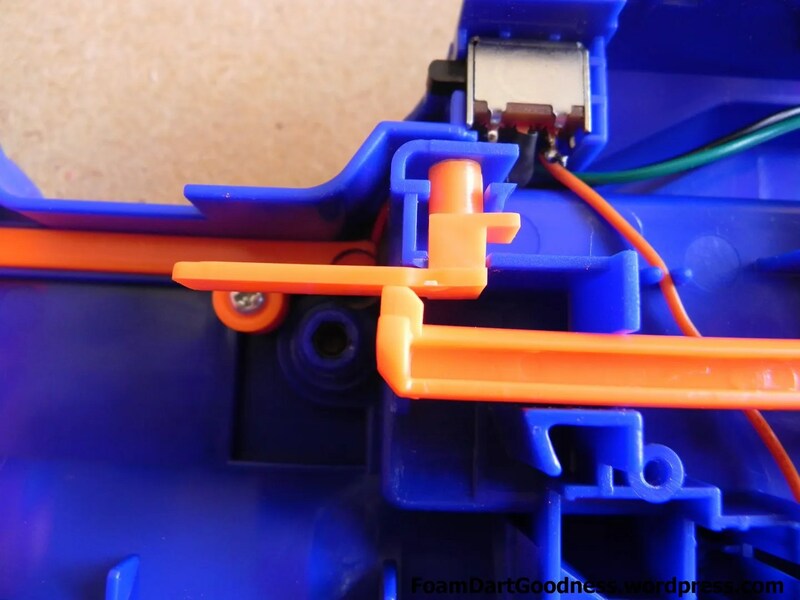 To do this we’ll start by de-soldering both the orange and blue wires from the bottom switch. The top switch is a little more complicated. 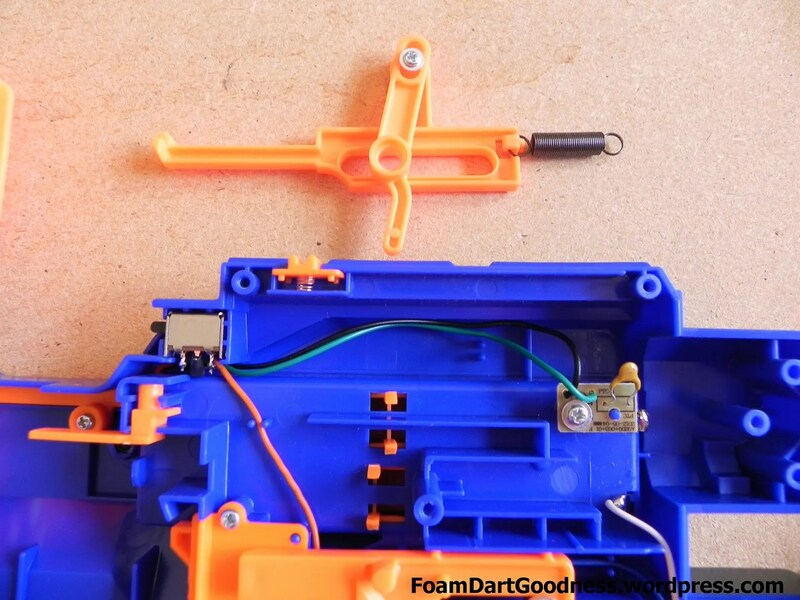 It has two negative inputs, one form the trigger and one direct from the battery, and one output. 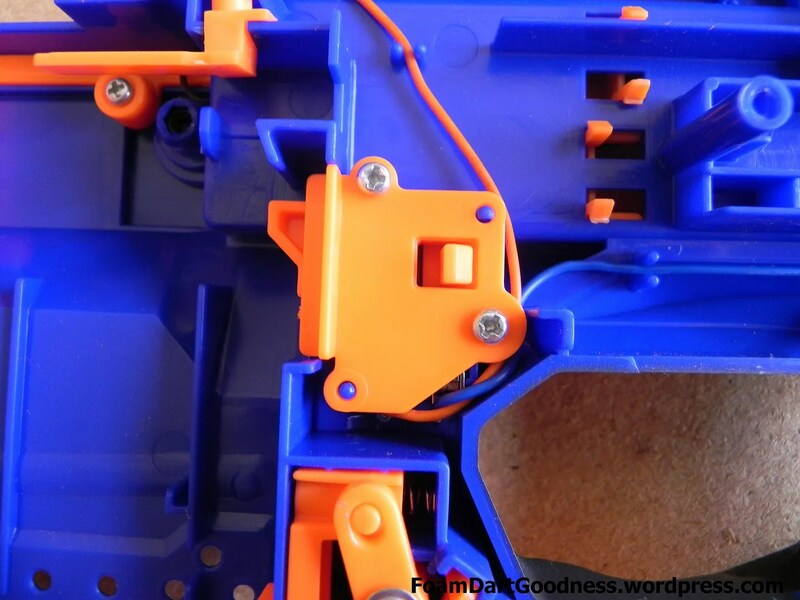 In absolution it’s essentially just a switch on the negative wire between the battery and the motor. Pull the heat shrink back. Then solder it to to the blue wire we removed from the other switch we removed earlier. We’ll see that it’s held in by a screw. Remove that. 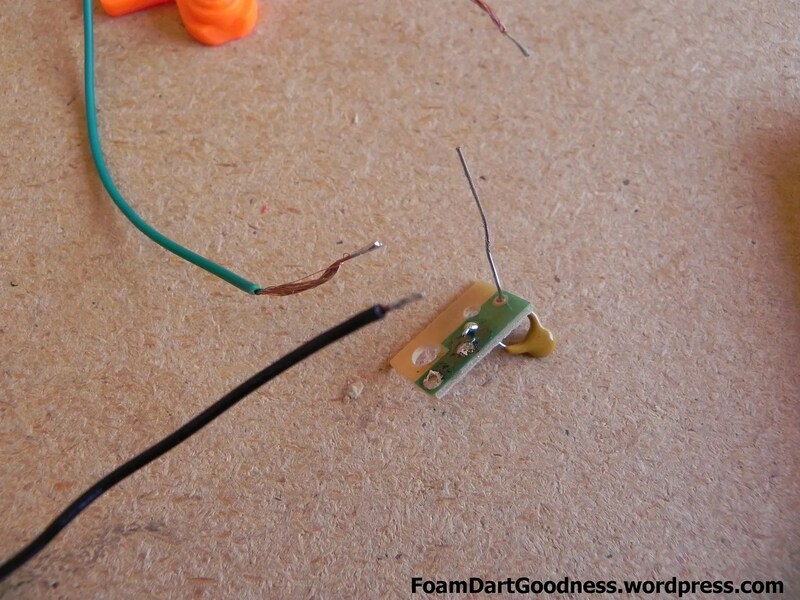 The thermistor is a component that apparently seems to confuse a lot of people but it’s a really simply component. Essentially the more voltage you run through it, the hotter it gets; the hotter it gets, the higher resistance it provides. For us this means that once it reaches a certain temperature it cuts power to the motors. 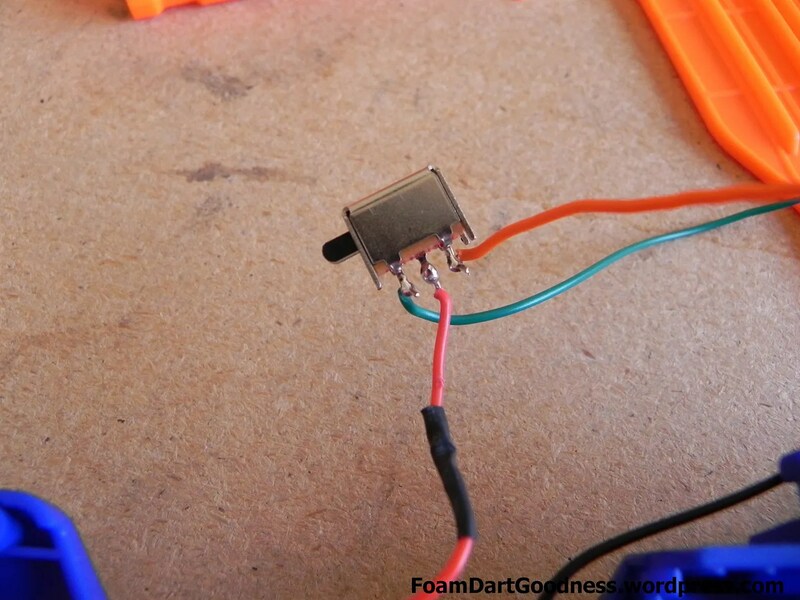 This particular thermistor will cut power after a few minutes of use at 9v, or almost instantly at 16v. Because we want to increase the voltage, we have to remove it. 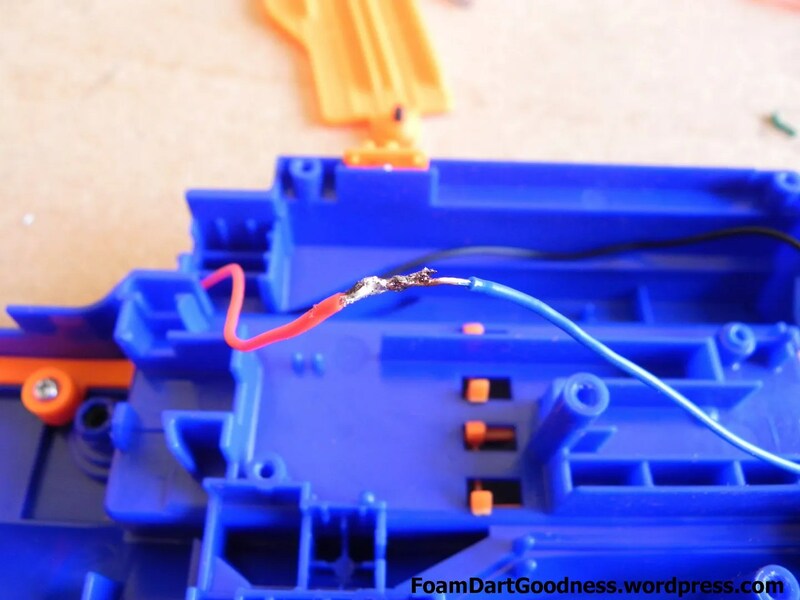 To do this simply desolder the black wire from the thermistor and solder it directly to the negative terminal on the battery. Also, good point to mention that we taped the red/blue connection we made earlier. Heat shrink would be better but I’m lazy. That’s about it folks; time for reassembly! First, the dart pusher and spring. One screw to hold it in and we need to slip the spring over the post at the end. Then the other half of the shell. 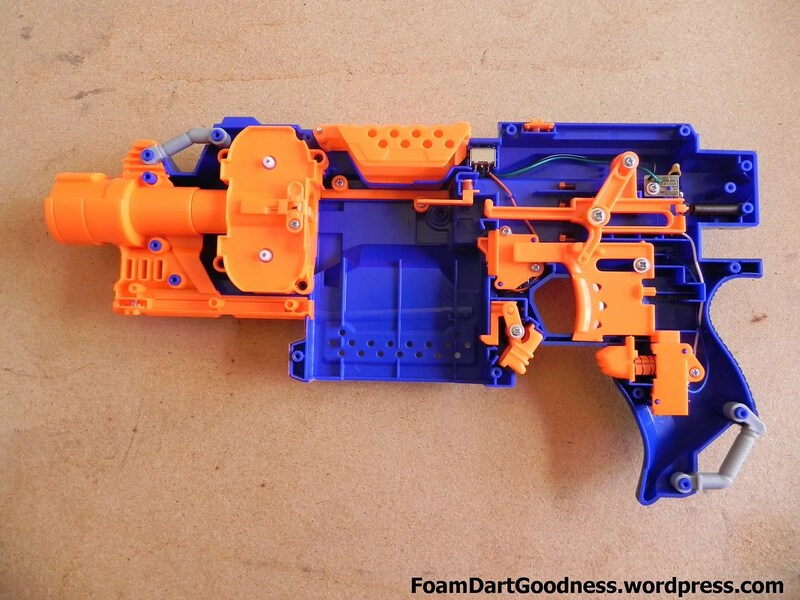 Which ever way you choose to power your Stryfe though, you should still be pretty happy with it. 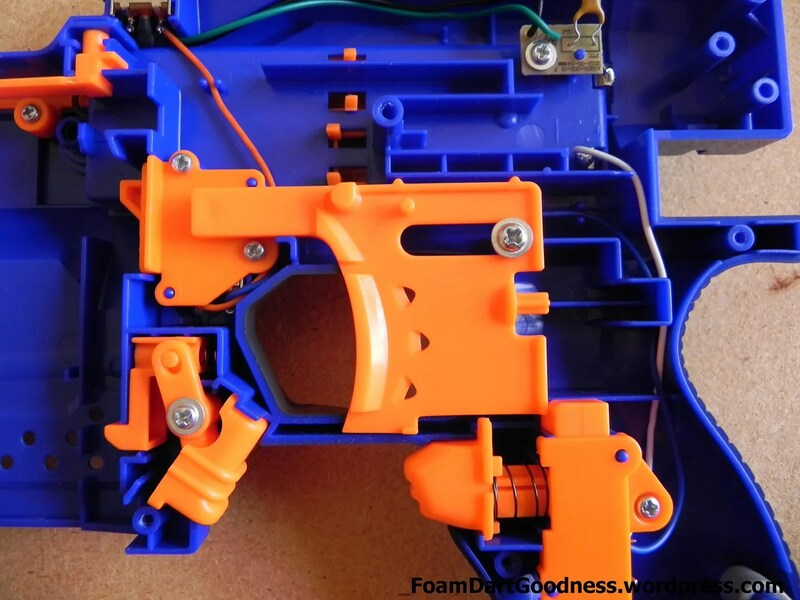 This entry was posted in Beginner Mods and tagged Blasters, Elite, modify, Nerf, Nerf mods, Nerf Stryfe, Stryfe by Joe. Bookmark the permalink. 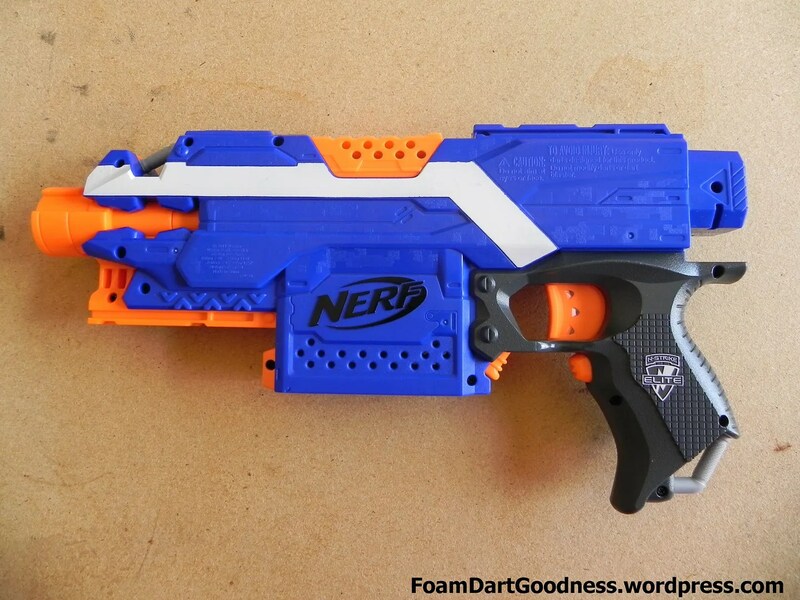 I’ve run the Stryfe at 8.4v, which is the most that’ll be allowed without mods before the blaster starts to shut down. I feel like I need the wheels to spin up faster most of the time, and I want to up it to another trustfire for 12.6v. However, I don’t own a soldering tool. So my recommendation is that if you using the Stryfe, your probably gonna take advantage of it’s high rate of fire for closer battles and engagements, so up that voltage to the 3 trustfires so you can fire sooner. 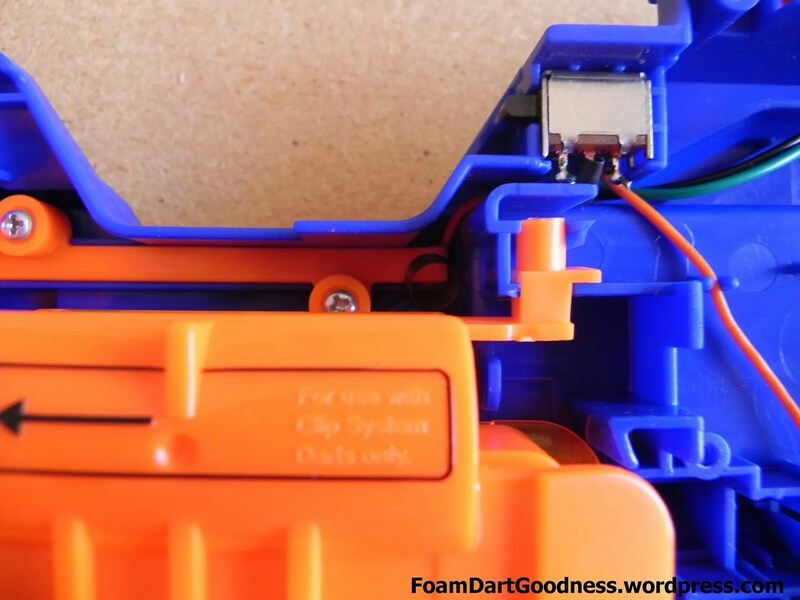 P.S The Elite Rayven flywheels spin up plenty fast enough for me at 8.4v, so I’ve been using that more then the Stryfe partly because of this. 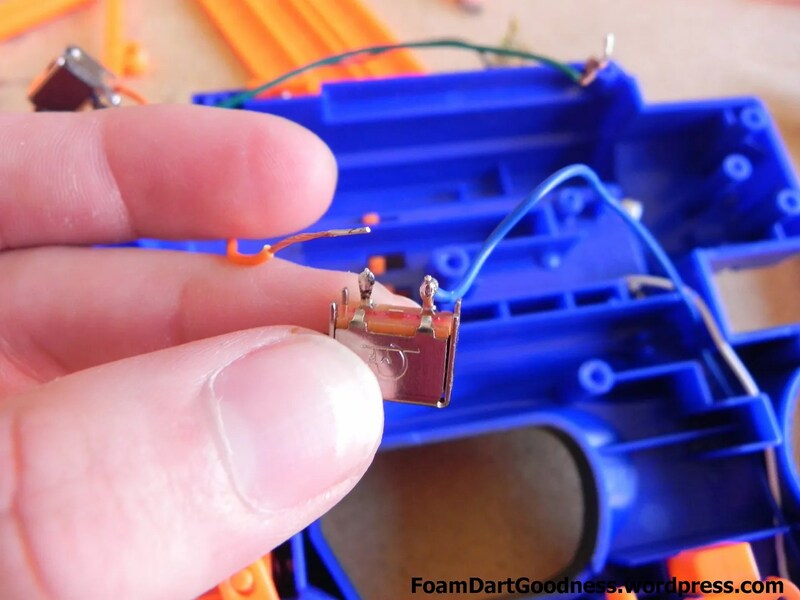 If you’re doing any electrical mods you have to get yourself a soldering iron. They’re not that expensive for a basic one and will open up a world of possibilities. I haven’t had a chance to play with the Elite Rayven myself yet but good to know. 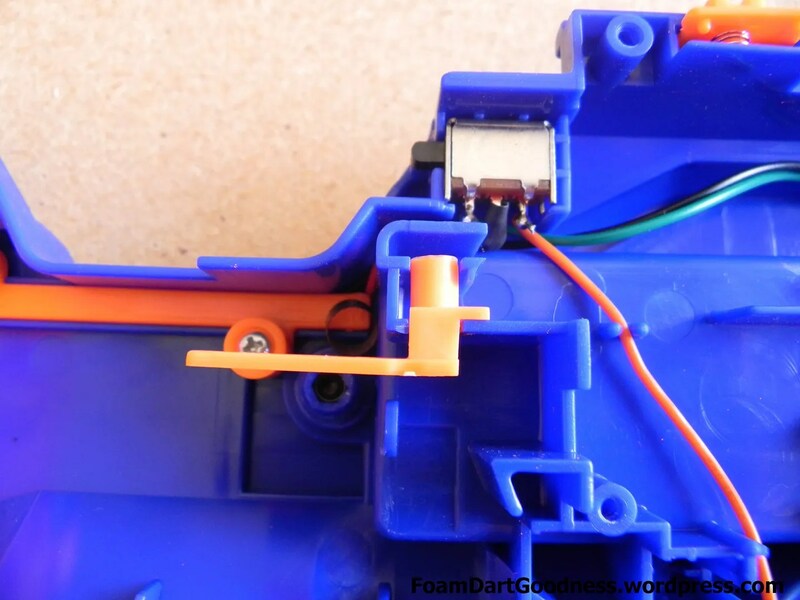 Is it okay if I cut the wires off of the switches instead of soldering them, and then pulling back the rubber and twisting the actual wires together to create current? 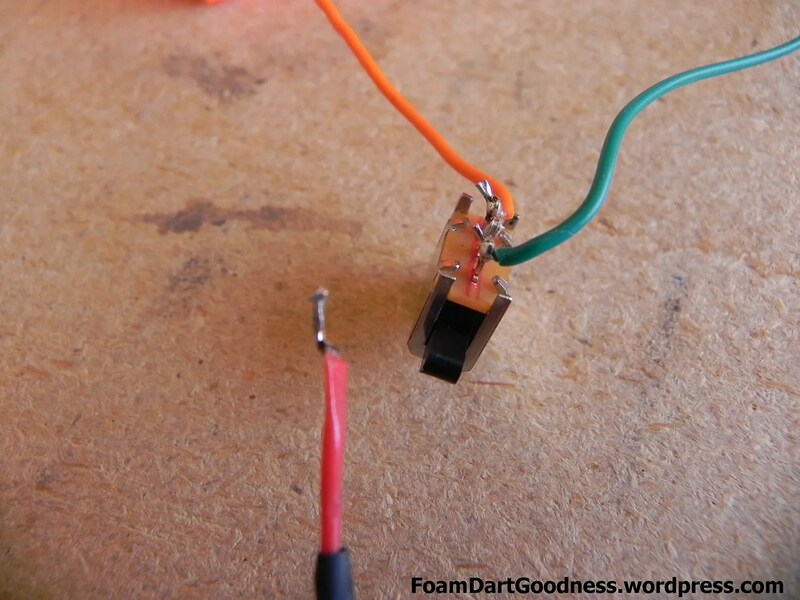 It will work, just be less reliable than solder. Electrical tape! Yep. Again, will work, just not as secure. 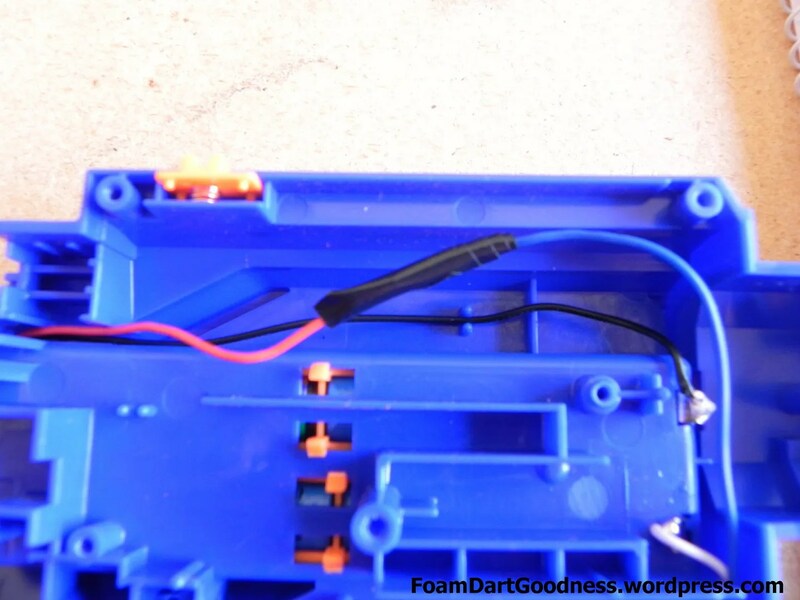 Another question, is it okay if I just connect the black wire to the negative charge on the battery pouch, and nothing else? My circuttry guy said that would be all that I need to do. 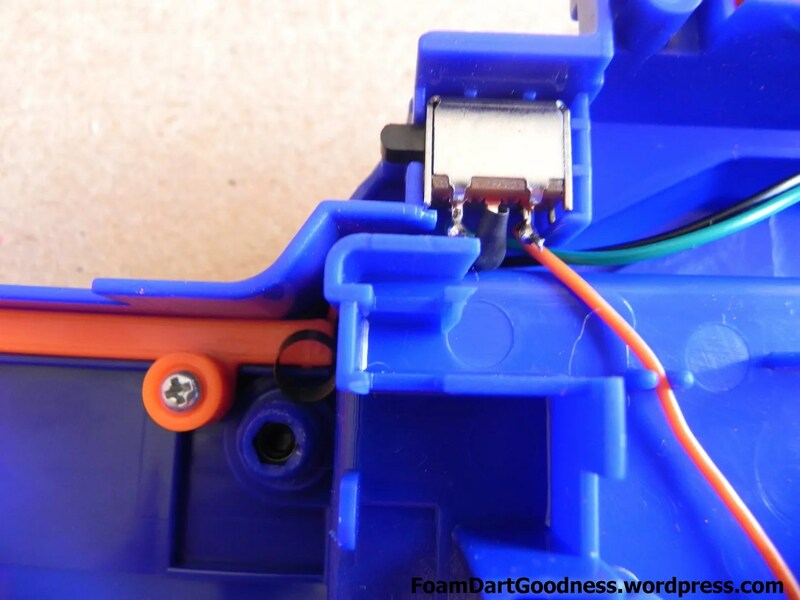 Thanks for this writeup, I wasn’t sure how to go about with the jam door switch and its three wires. I find it somewhat amusing that the wires are conveniently just long enough to accomodate for the re-wiring and fit into the trenches in the shell. I’m only going to be removing the thermistor to run it on 3 ultrafires. There’s another wire (green? I’m colorblind…) connected to the thermistor. What do I do with that? Don’t need it. It’s just a double up on. 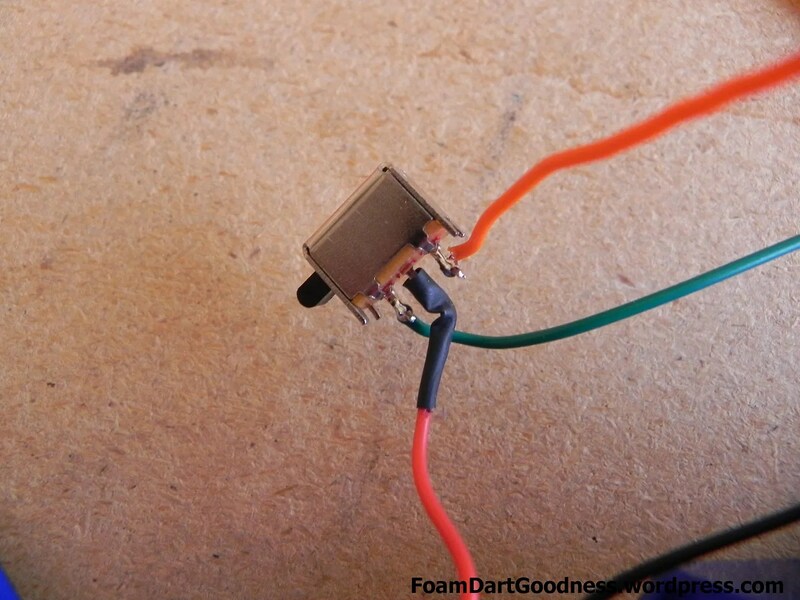 Thanks for tutorial, I was thinking that if I remove thermistor for voltage mod (Which I want to do) will it not harm the motors? 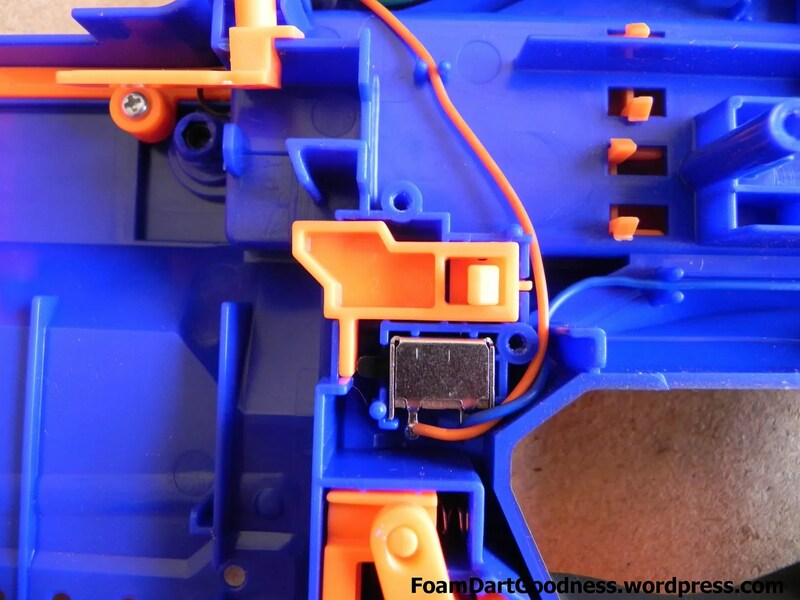 Increasing the voltage will harm the motors and shorten their life. Might not be by much, it might kill them tomorrow; can’t say for certain sorry. 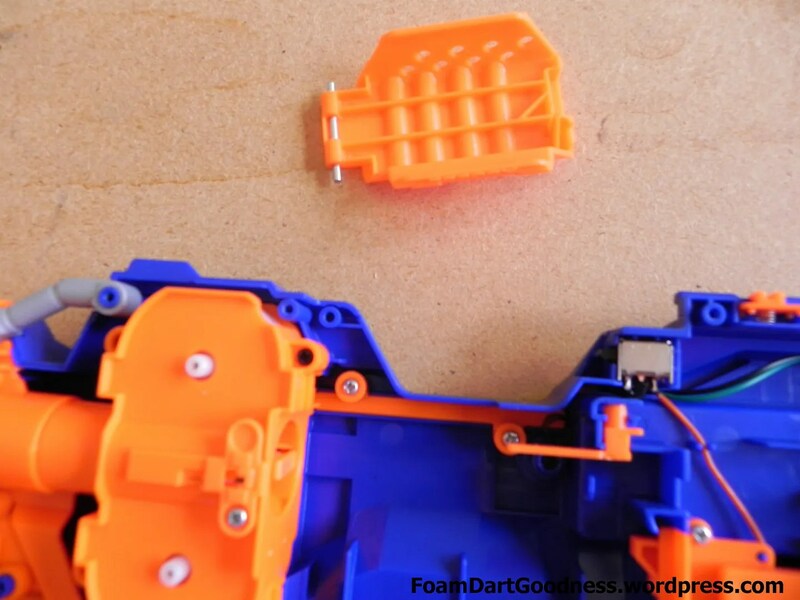 I do have a Strongarm… but I kinda broke it. Can’t really compare sorry. Ahhh… By that logic, go for it then! I find the smaller, manually priming blasters to be way more fun. Spraying the room with darts just means you have to go pick them all up again. 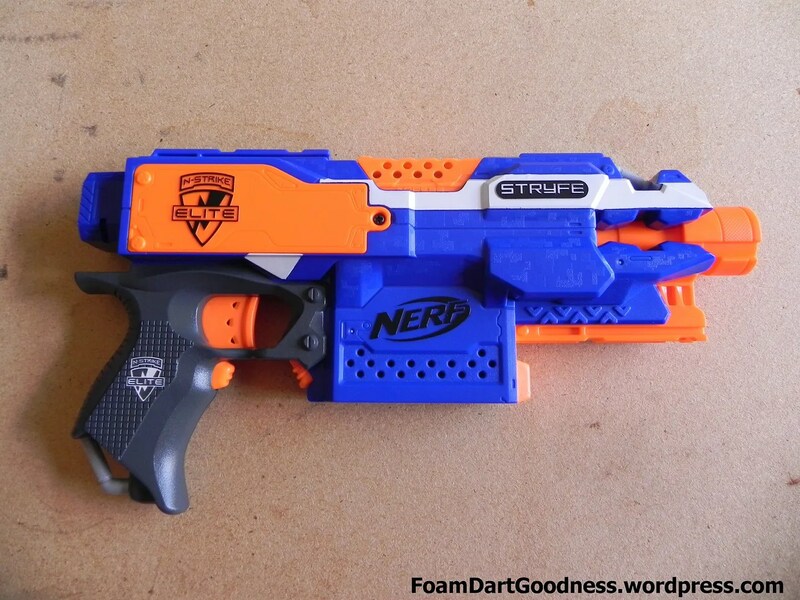 Thanks Joe for the advice, I already bought Strongarm, ya it sure is fun specially with Dart-tag darts for target practice..also it looks solid and very pretty, however my Stryfe is still preferred option for battles (for no time wastage in re-loading gun and multi-shots can be done with just 1 hand). how much does this increase the range by? Depends how many volts you run through it and what darts of course. Can’t give a definitive answer sorry Steve. Where can I find affordable dummy batteries?? Btw this mod is awesome and the guide is very well done. 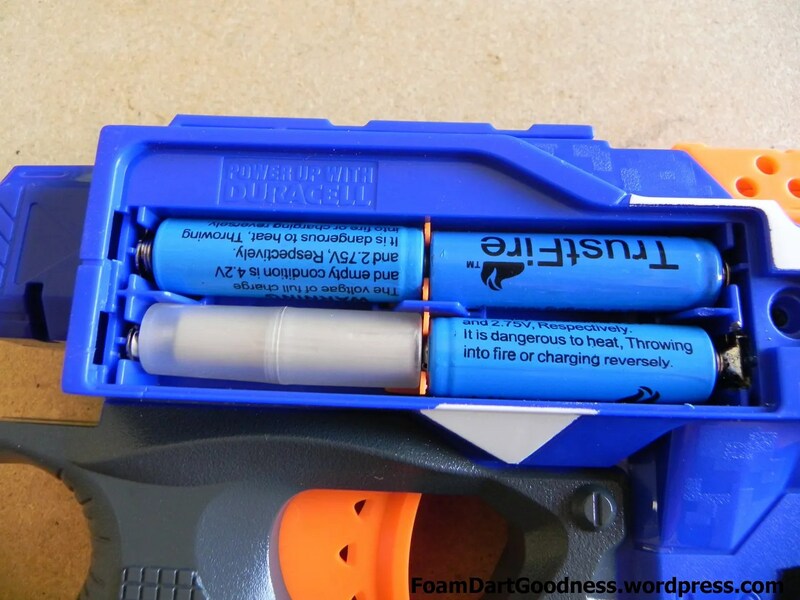 Check eBay, or even make your own (DIY – AA and D Sized Dummy Batteries). Hi, just wondering. Does the wiring need to be replaced for better voltage? I’ve had few modders say that it’s better to do so. 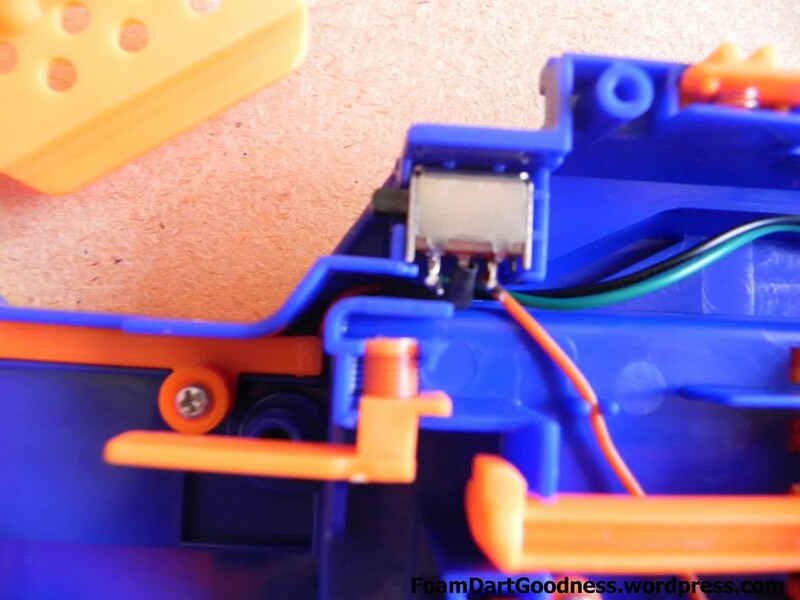 But there have been a few others who advise that the wires in the stryfe are enough to run 3 trustfires. Eh. You could, but I doubt it would make much of difference. It’s not a lot of current flowing to the motors. I also heard something similar. 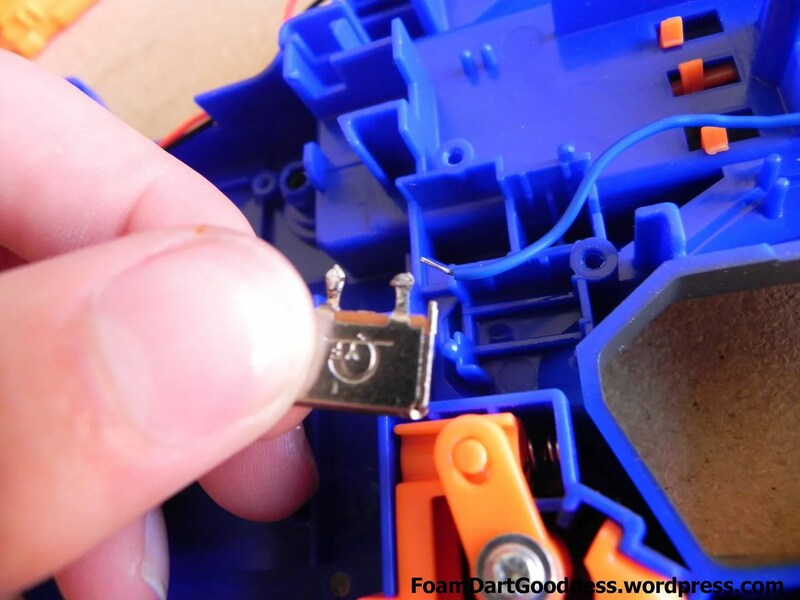 What about removing the motor resistors(I think that’s what they’re called)? I’ve gotten fairly inconsistent results from replacing the resistors with a piece of wire, but have burnt out a pair of motors almost immediately. I haven’t tried since. 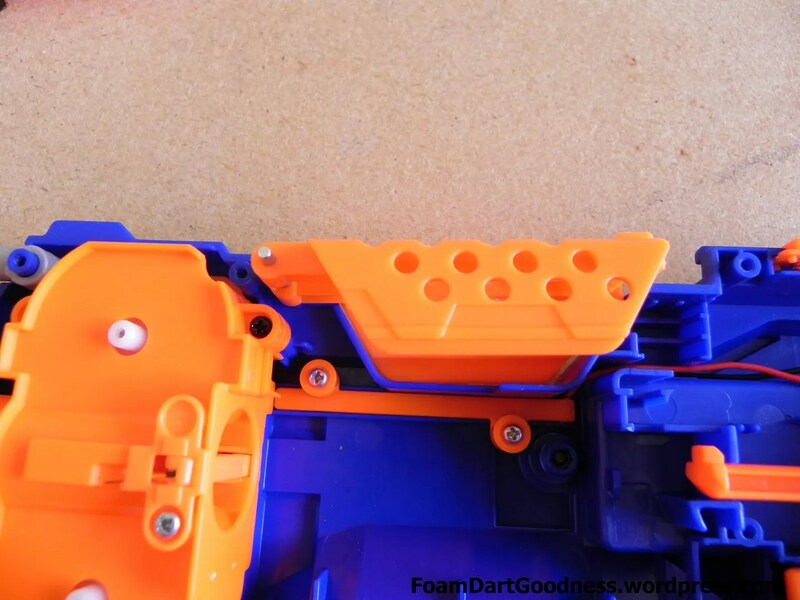 Instructions were all spot on, my Stryfe is now running with no safeties! Just waiting for some Ultrafires to arrive so I can overclock this puppy! Great guide, only suggestion I might make for improvement is some editing on some of the photos to highlight some of the screw locations. 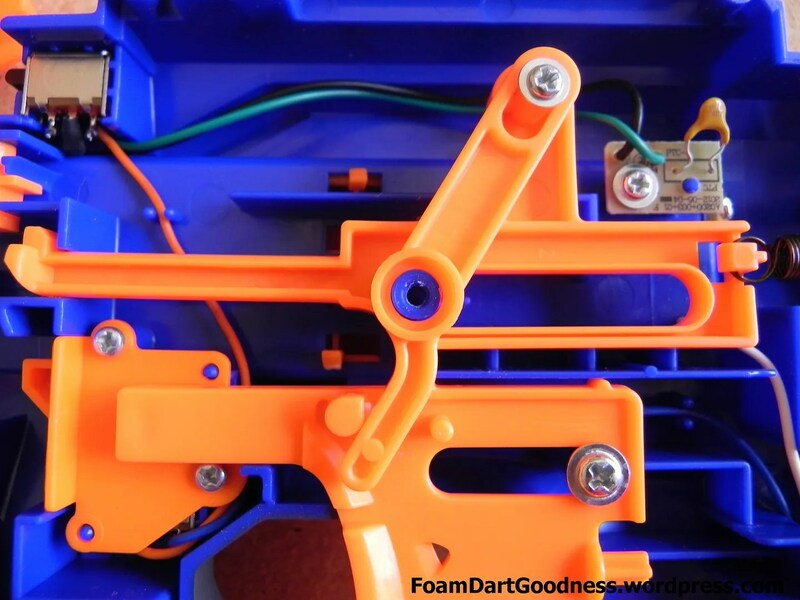 Can’t tell from the pics but the darts are propelled by the motors right? 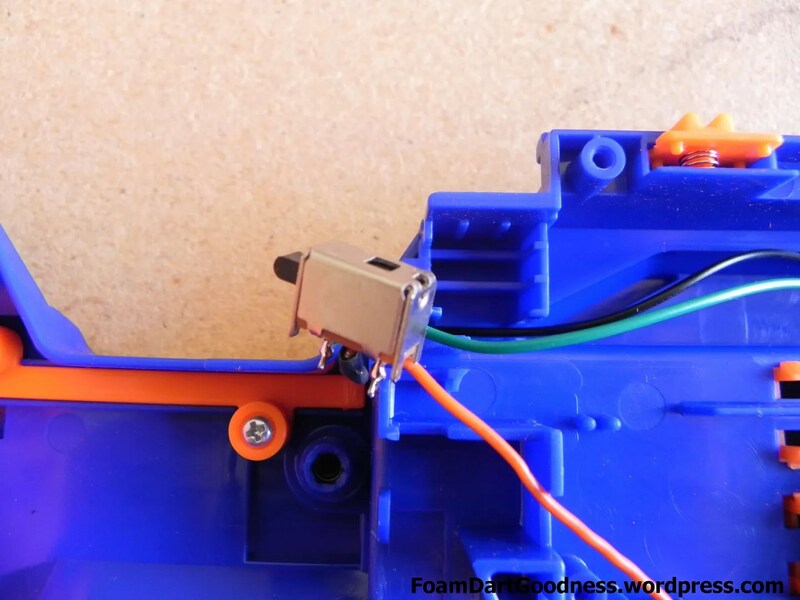 In other words the trigger just pushes the darts in to the barrel where the motors are waiting? 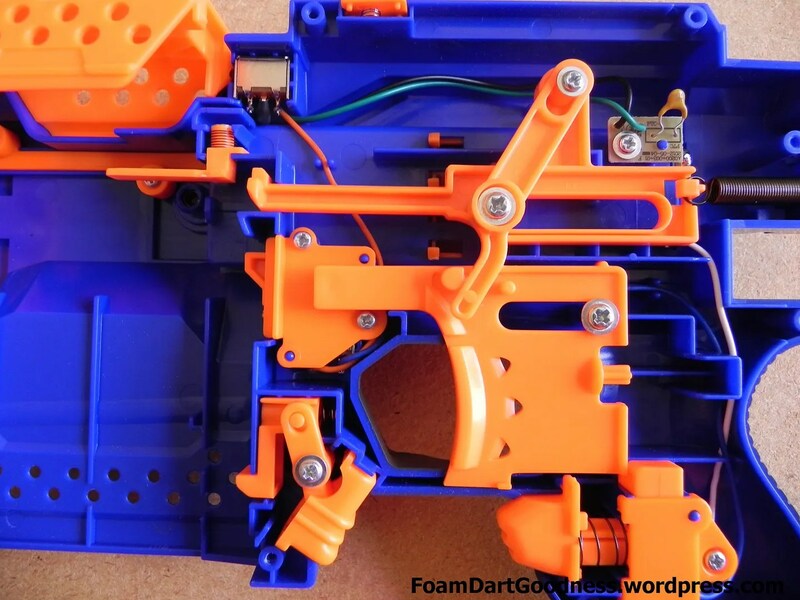 If this is the case I plan to control the firing mechanism via a microcontroller. Thanks and great post! Yep. 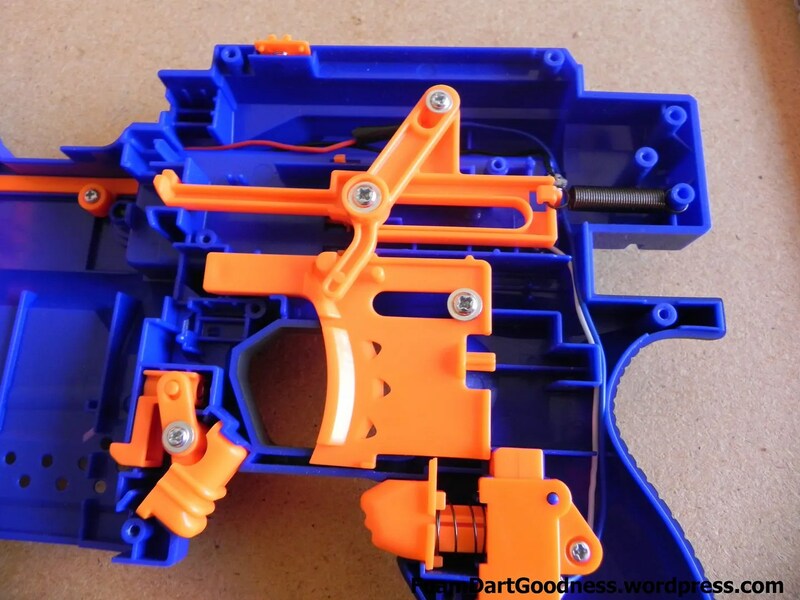 The flywheels at the front propel the dart; the trigger is only there to act as the part pusher. Make sure you send us photos once you’re done! 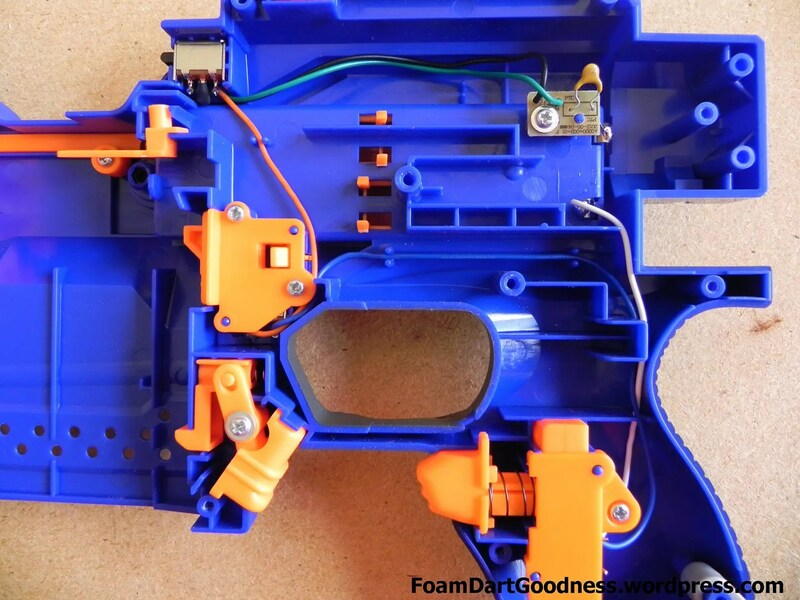 Well, that’s funny… I’m also looking to control a Stryfe via a microcontrollers. Only started looking into it within a few hours of your post’s timestamp. Multiple personality disorder, or odd coincidence? Hey there. Another question. 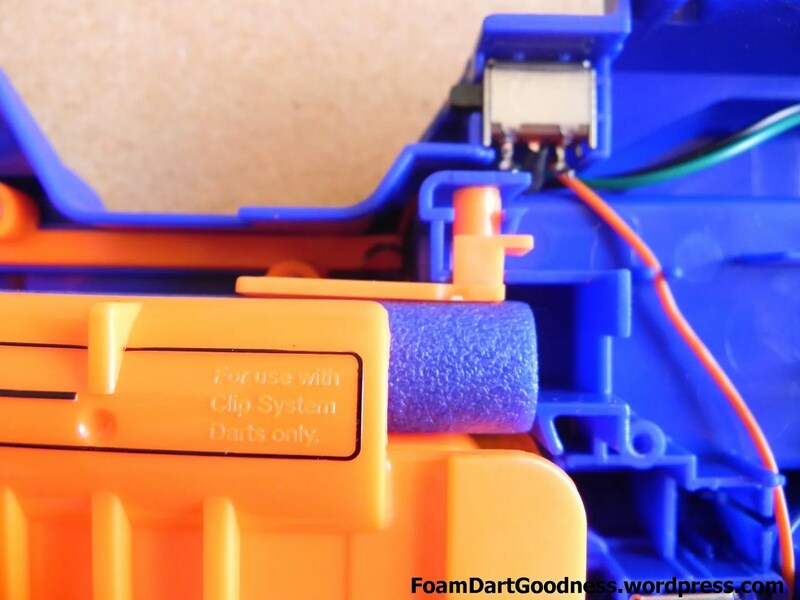 Can the modded stryfe run on both unprotected or protected trustfires? I only intend to run 2 of them plus 2 dummies. There seems to be many different opinions in the forums. I meant either 2 unprotected or 2 protected (+ 2 dummies). Nvm lol. Found the answer to them. Just got my protected and unprotected trustfires…the protected ones don’t even fit the stryfe lol. Thanks, I need t remove the dart checker as it keeps squashing my Elite darts and jamming up everything.